We fall victim to the lingo too—hell, even the title of this post uses “digital branch” when we really just mean your website. However, instead of throwing lofty corporate speak around, let’s break down the typical credit union digital marketing goals and look at how effective credit union websites are attracting new members and thrilling the existing ones. Consumer habits and buying behaviors are quickly shifting, and the traditional marketing model built for physical branches is stale and outdated. The fact is, your members and potential customers have certain expectations online. If your website can’t deliver, you lose business to someone who can. Considering the reach and accessibility of a website compared to that of a branch location, it makes sense to approach your website with same amount of care and strategy, if not more, that goes into constructing physical branches. The credit unions we work with usually are usually concerned with similar issues. While our methods to address these issues vary, the result is a website at the core of your marketing system that serves as a constantly evolving tool for inbound marketing, lead generation, and content creation. How do we expand our reach to mobile devices? Smartphones and tablets are incredible. This might be old news, but it’s a good reminder that more and more people every day are deciding to access the web via the device in their pocket rather than standard computer. According to Consumers and Mobile Financial Services 2014, over half of all smartphone owners consistently use mobile banking—and the numbers are steadily growing each year. As mobile and tablet browsing begins to eclipse desktop computing, credit unions are building device-agnostic experiences through responsive design. Responsive design not only automatically scales content for a wide range of screen sizes but also dynamically prioritizes content and adapts on-page elements according to the size of the device used to view the website. Our content strategy involves thinking about and researching how your members and potential customers will interact with and progress through the website. Chances are, the majority of your members just want to check their bank account(s) on your website—so why not prominently feature the login button? For a site we recently built for WSECU, we removed the clutter in the top navigation bar using a hamburger menu, which allows members who are only interested in their balance to quickly login without superfluous clicks. While the site is scaled for different screen sizes, the login remains isolated and clear. While credit unions invest time and resources to better serve their members, customer acquisition remains a top goal for any credit union. 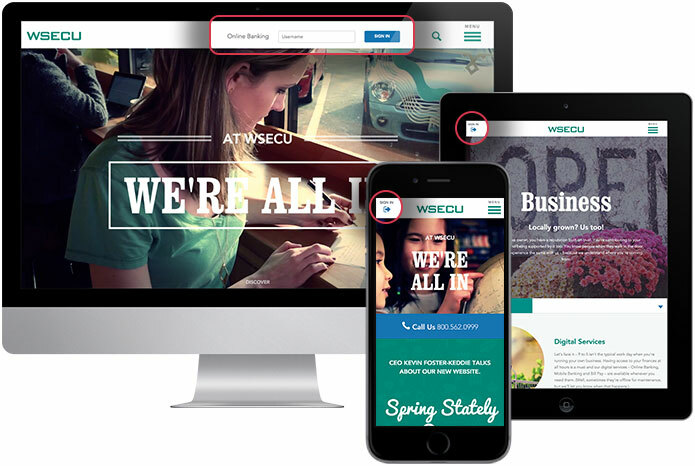 Visually appealing, easy-to-use websites offer credit unions (and their marketing agencies) a platform to create and promote original, targeted content on a regular basis. Continual, strategic content production improves search engine rankings and enables interested potential members to self-serve information and connect with the credit union and members. In lieu of general statements about the quality of your services, tell stories, share information, and deliver personalized value to your members. Potential members will certainly see the worth when they compare it to their current credit union or bank, which just lazily posts the most recent home loan rate. How do we upsell current members? Another key goal of credit union marketers is to upsell their current members on other products and services. Marketers try their damnedest to tactfully shove loans, e-statements, deposit accounts, and many other offerings at current members to increase a member’s products/services-per-household. Effective credit union websites utilize intensive content strategies, which include identifying target personas and mapping out user-flows throughout the website—thus ensuring compelling on-page content, relevant links, and distinct calls-to-action throughout the site.